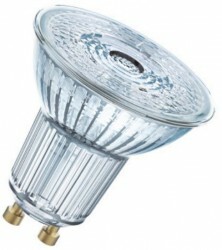 Osram LED Parathom Advanced 8W=80W GU10 Advanced is part of Osram's new Ledvance portfolio, a top value DIMMABLE lamp. Rated for up to 25,000hrs and warrantied for 5 years. White (3000K), 36Deg beam angle, 55mm L x 51mm dia fit and forget.